Planning a Vegetable Garden? How to Make a Vegetable Garden. First off, thanks for a great introduction post As a brand new gardener in Ireland (originally from Canada) I'm really looking forward to not having to wait till May or so to start planting! 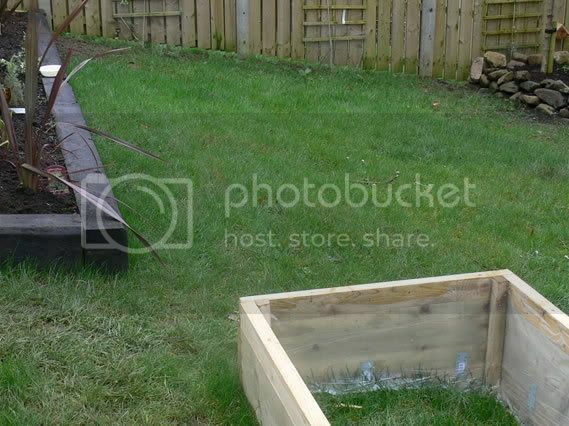 I am definitely interested in creating some raised beds, and would prefer to go with non-treated wood if at all possible. In the original post, you specifically mention scaffolding planks or untreated joist wood .. where would I find this to buy (preferably in North Dublin)? I built a fruit and a veg bed, both 6ft Long x 3 ft Wide x 3ft Tall. IThey actually sit in a hidden and sheltered area of the patio, but with good sunlight. I went to a timber merchants (Heaton Buckleys) and asked if they would cut these untrreated timber to scale, but they said they couldnt. He did however tell me I could have whatever "scrap" wood i wanted from the scrap skip for nothing. I got all the timber i needed, though spent a few hours pulling nails out of the wood. I lined it with weedblock and got a good ,mix of soil and homemade compost in it. 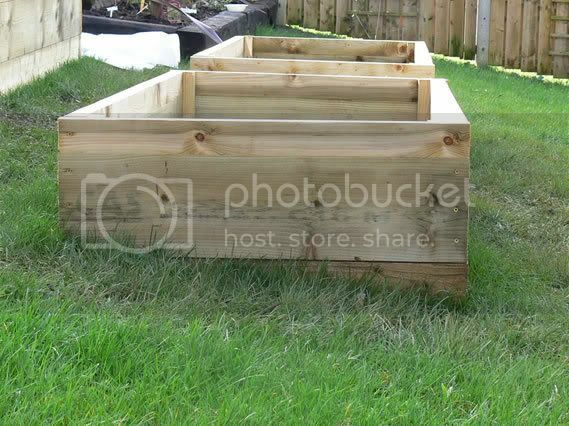 Posted: Sun Mar 09, 2008 8:02 pm Post subject: Raised beds: Are six enough or do I need eight? 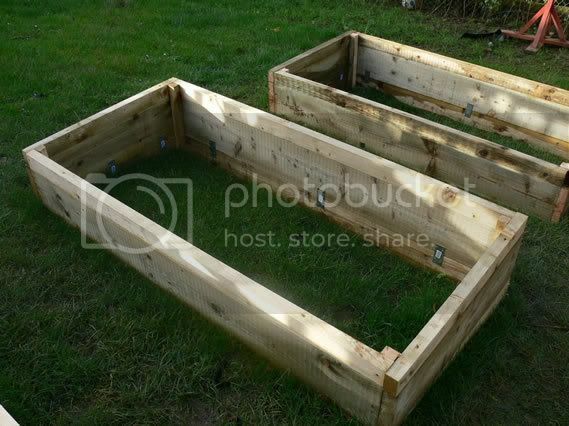 I have now made six raised beds (pictures to follow soon) and am considering making another two, if I really have to. They each measure 6' x 3' and are a minimum of 12" deep and they are to feed four people. The problem of making another two is that when I eventually get my greenhouse, it will have to go about six feet downhill of some railway sleepers, which I am concerned about the toxins in the sleepers leaching into the soil. Do I really need another two beds? If so, should I be concerned about the proximity of the railway sleepers to my greenhouse? 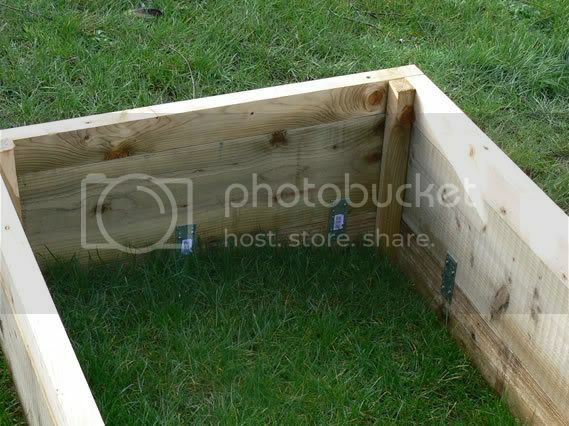 Posted: Mon Mar 10, 2008 11:12 am Post subject: Re: Raised beds: Are six enough or do I need eight? I would say see how you get on this year with your six raised beds, that solves the problem for the moment of your sleeper proximity. I see so many enthusiastic gardeners with the best intentions in the world create large veg gardens in the first year, only to get fed up with all the maintenance tasks especially during a dry summer, or else put off by a glut of veg coming all at once. Some of these gardeners never look at growing vegetables again. So I say take it handy for this year Yorky and see how you get on. Looking forward to those pics, they should provide encouragement to those starting new veg patches. What about the toxicity of railway sleepers for fruit trees also? I've got several fruit trees abutting a railway sleeper edging - will the fruit also possibly contain toxins from the sleepers? 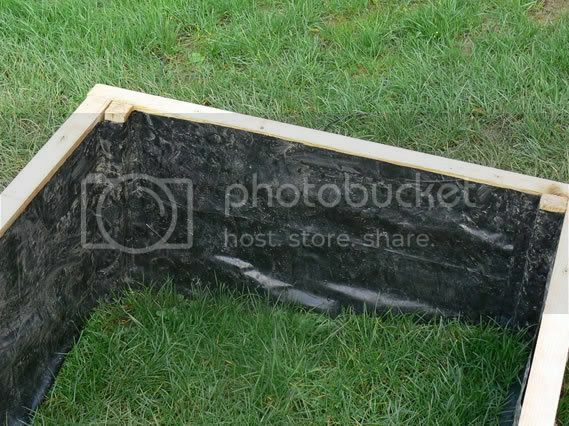 Is clear plastic sheeting alright for lining raised beds? Only 25m rolls of black polythene at â‚¬18 are available locally but they cut me some clear plastic for â‚¬2! Is there any reason not to use clear plastic? Is clear plastic sheeting alright for lining raised beds? If it was my family, I would not have reclaimed railway sleepers near a growing food source, full stop. If you plant next or near sleepers, then I suppose the farther the crop is from the ground the safer it is. So carrots very bad, lettuce bad, apples better, as you have less chance of surfaced ground water splashing on the food. Wash everything well, and try to pick the fruit instead of letting it fall to ground. Be aware that your soil type will affect the way soil water travels through your soil, sandy soil will cause much more rapid movement of water vs sticky soil. It may be a lot of worry over nothing, but is worth being aware of these things anyway. 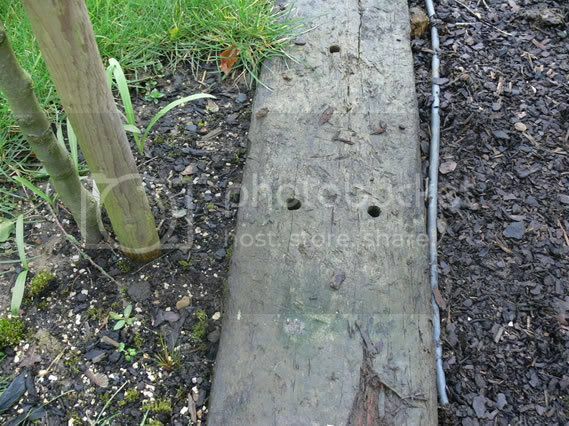 And here's some photos of the railway sleepers in question - the ones adjoing the fruit trees. I think the ones adj. the fruit trees would fall into the 'sleeper 1' category 'Dutch Oak' which is about half way down the web page. On the other hand the sleepers in the back garden seem to be newer and there is a strong odour and visible signs of tar. These are adjoining the proposed greenhouse site and adjacent to the raised beds so I think I will replace these (three to four in total). 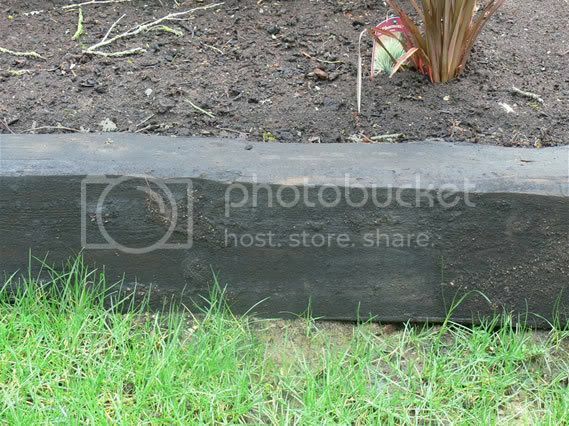 I am concerned about having any railway sleepers but I'm tempted to leave the older ones next to the fruit trees in-situ. Any comments on any of the above would be most welcome. 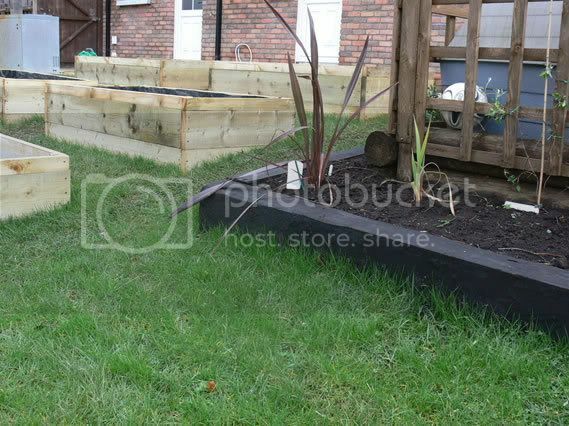 The raised beds look great Yorky, plastic lined and all. I feel though that the apple trees roots may be impeaded by the closeness of the sleepers. I imagine the roots not liking the feeling of touching a solid length of sleeper with traces of oil etc. Thanks for your reply, GPI. 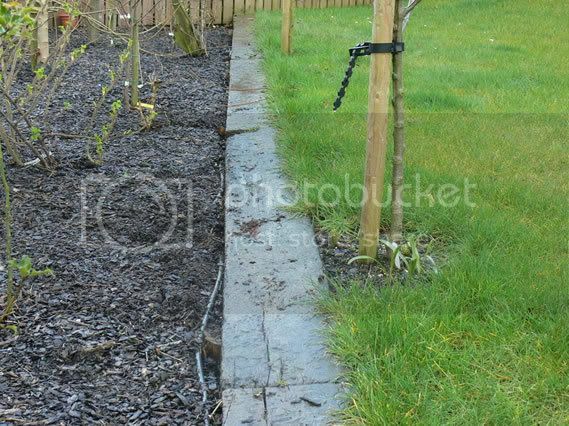 Considering that there is little sign of seepage from the sleepers and the reduced risk for a fruit tree if there is, I don't think I will move the trees. They were planted in November 2006 - should they bear fruit this year? I want to introduce Ladybirds into my garden as a form of biological control - does anyone know where I can buy them online? Also, when I get a greenhouse should I put some in there and should I provide some food until there are some prey? Also, I want to use some netting to protect my seedlings from birds - my intention is to spread it over the beds to prevent bird damage - I tintend to put pegs in to the soil to support it - what height should the net be above soil level to allow for the variety of vegetables I am growing? I also want to use Nemaslug and copper tape for slug control - does anyone know where I can buy these online along with Enviromesh? How often should I water the raised beds (nothing showing in some and a few seedlings in others)? The soil is cracking in some of the beds and I paid for this topsoil! - shall I just persevere and and add farmyard manure next year? What is the best way to support peas and what space between the drills should I leave? It says 3ft on the packet! Because raised beds have greater exposure to sun, wind, and heat, they need to be watered more frequently than a regular veg bed. 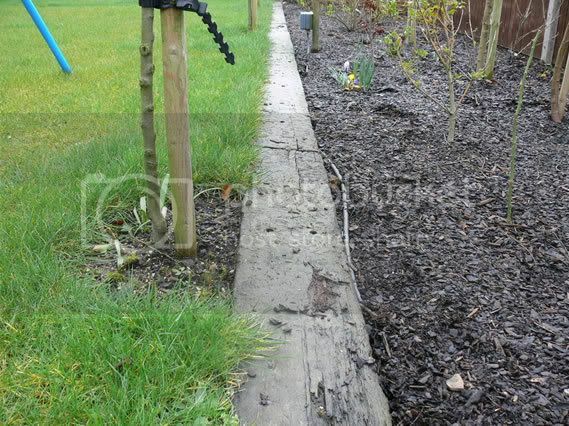 Raised beds may need may need to be watered as often every 2nd day depending on the drying conditions. A rule of thumb..... Feel the soil with your fingers, if the top inch of soil feels dry, then water . Persevere, it may not be as bad as you think. Add organic matter and drainage grit next winter. Do what the pack says and have a look here.... Pea support. I have left nearly three feet, as per the instructions on the packet. I'll get some posts and nettting for support- should I put it between the drills which would mean the netting is about 15 inches away from each drill? Another issue I had today is with calabrese and tomato seedlings. I sowed the seeds in a seed tray with a lid and the seedlings are ready to plant out into pots. I had the seed tray on an indoor windowcill and today I put it in the greenhouse with the lid off and the greenhouse door open for about an hour while I was busy elsewhere. The leaves seem like they have withered for some unknown reason - does anyone know why so and will they recover?